The transfer window – a sign of things to come for Latics? Brendan Rodgers’ hapless quote did not go down too well with the fans. The Luis Suarez saga dragged on for so long, but the end-result was that the player got what he wanted with a move to Barcelona. Suarez had been pivotal in Liverpool’s challenge for the Premier League title. His departure seriously weakened a team that had come so close to winning the Premier League. Nick Powell’s departure from Wigan Athletic over the January transfer window would also have seriously weakened a team striving to win their division. The media was awash with stories telling us that other clubs were bidding for him. We had to hold our breath until the window closed on Wednesday evening. Powell’s case is remarkable among modern day footballers. Indeed, it was so refreshing to get away from the media hype of Alexis Sanchez and Manchester United, instead hearing how a player did not want to go a higher division to earn a much bigger salary. Powell quite simply told his chairman that he wanted to stay at Wigan and consecutive bids from Brighton were turned down by the club. January transfer windows have been depressing affairs over recent years at Wigan Athletic. The decimation of January 2015 immediately comes to mind, when Dave Whelan had Malky Mackay boot out so many household names, together with players who had only been signed in summer. It was a matter of reducing the wage bill more than anything else. Relegation was not a surprise consequence of those actions. Add to that the woeful comings and goings in 2017 under the inept Warren Joyce. None of the 13 players he signed were at the club when the current season began. But the January 2018 dealings were by no means depressing, and if anything, they were positively uplifting. So, what has changed at the club? First and foremost is the manager. Paul Cook has shown the kind of shrewdness in hiring and moving-on of players that has been lacking at Wigan in recent years. When Lee Evans left to join Sheffield United, early in the transfer window, it looked like a case of David Sharpe not being willing to put up that extra money to keep the player. Evans had been excellent and wanted to stay at the club. But the signing of Jamie Walker from Hearts looked like a step forward, a player who can play the number 10 role that Nick Powell currently occupies. Within a few days James Vaughan was signed from Sunderland, an experienced player who has not only played most of his football in the upper two tiers of English football but has a superb goalscoring record in League 1. The loan signing of Jay Fulton from Swansea was to follow, then on deadline day Devante Cole was signed from Fleetwood for reportedly £400,000 and Donervon Daniels brought back from Rochdale. Cook has brought in largely younger players, together with the 29-year-old Vaughan. Walker is 24 years old, Fulton 23 and Cole 22. Daniels is still only 24. His contract runs out in summer. Cole’s signing was a bit of a surprise, a third central striker to challenge Will Grigg and James Vaughan. However, Cole might well be used on the flanks when needed. Only time will tell if the players brought in during January 2018 will make a success of it at Wigan. But their profiles certainly look promising and the blend seems right. What is surprising is that David Sharpe has spent more money over January when the club are heading for a financial loss for the season. It is not what we have come to expect in recent years. Reports suggest that the current wage bill is around £10 m, which cannot even be met half way by gate receipts and EFL subsidies. Part of the funds paid out in January will be offset by a 30-40% share of the £1.5 m transfer fee of Jack Hendry from Dundee to Celtic. However, the takeover by the Asian consortium appears imminent. Has this influenced the transfer window dealings? Moreover, will David Sharpe continue when the takeover happens? 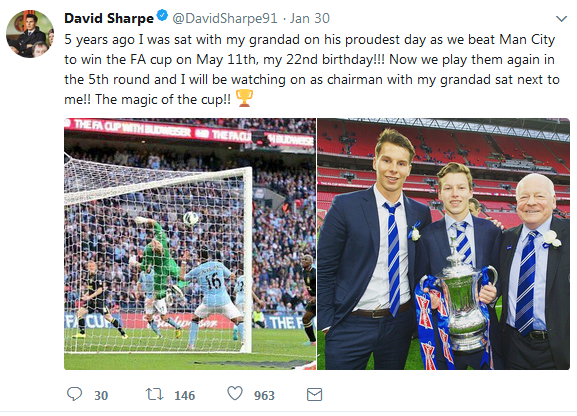 Does Sharpe’s tweet give us a clue?